Stephanie Blythe (born 1970) is an American mezzo-soprano who has had an active international career in operas and concerts since the early 1990s. 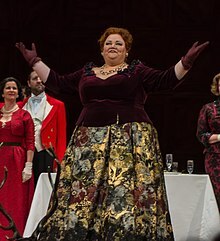 She is particularly associated with the Metropolitan Opera in New York City, with whom she has performed annually since her debut with the company in 1995. In 2014 she starred as Gertrude Stein in the world premiere of 27, an opera composed by Ricky Ian Gordon with libretto by Royce Vavrek, and commissioned for her by the Opera Theatre of Saint Louis. Blythe grew up in Mongaup Valley, New York and studied the flute as a child. She graduated from Monticello High School (New York) in 1987. While attending Monticello, she was first exposed to live opera when her high school music teacher took her class to the Metropolitan Opera for a matinee of La bohème. She went on to study vocal performance at the Crane School of Music at the State University of New York at Potsdam (SUNY Potsdam), from which she graduated with a degree in English Writing in 1991 and a degree in Music in 1992. In 1994 she won the Metropolitan Opera National Council Auditions, and then became a member of the Lindemann Young Artists Development Program at the Met. Blythe made her professional opera debut at the Metropolitan Opera as the Voice from Above in Wagner's Parsifal on April 14, 1995. Her career was transformed the following season when she stood in for Marilyn Horne at the Metropolitan opera as Mistress Quickly in Falstaff and received rave reviews. She has subsequently achieved critical success in a variety of roles at the Met, including Amneris in Aida (2012), Auntie in Peter Grimes (1997, 2003), Azucena in Il trovatore (2013), Baba the Turk in The Rake's Progress (1998), Berta in The Barber of Seville (1995), Cornelia in Handel's Giulio Cesare (1999), Eduige in Rodelinda (2004-2006, 2011), Fricka in Die Walküre (2008, 2011-2013) and Das Rheingold (2010-2013), Frugola in Il tabarro (2007), Gertrud in Hansel and Gretel (1997, 2001-2002), Jezibaba in Rusalka (2009), Jocasta in Oedipus Rex (2003-2004), Ludmila in The Bartered Bride (1996), Madelon in Andrea Chénier (1996), Mama Lucia in Cavalleria rusticana (1997), Mother Marie in Dialogues des Carmélites (2002-2003), Orfeo in Orfeo ed Euridice (2009), the Princess in Suor Angelica (2007), Ulrica in Un Ballo in Maschera (2007-2008, 2012) and Zita in Gianni Schicchi (2007) among other roles. In 2000 Blythe made her debut with the Seattle Opera as Fricka and the Second Norn in Wagner's Ring Cycle. She has since returned to Seattle frequently, portraying such roles as Amneris, Dame Quickly, Isabella in L'italiana in Algeri, Waltraute in Götterdämmerung, and the title role in Bizet's Carmen. In 2002 she made her debut at the Santa Fe Opera as Isabella in L'italiana in Algeri. In November 2006, she starred in the world premiere of The Sailor-Boy and the Falcon, an opera based on "The Sailor-Boy's Tale" by Isak Dinesen. The work of SUNY Potsdam professors Paul Siskind (music) and Alan Steinberg (libretto), the opera was performed at the Sara M. Snell Theater of the Crane School of Music by the Crane School's Opera Ensemble. "Blythe ... steals the entire show. ... It’s unlikely that this supporting role has ever been sung with this caliber of gleaming operatic voice. She ... threw off the rapid-fire patter duet "There is beauty in the bellow of the blast" with blazing speed and crystal-clear diction. Blythe also displayed a great comedian’s timing making every punch line register. And, for a woman of such imposing physique, she showed herself a graceful and light-footed presence with her little victorious dance steps." In 2011, Blythe premiered the solo mezzo-soprano role in John Corigliano's One Sweet Morning at Avery Fisher Hall for the New York Philharmonic, a composition commemorating the tenth anniversary of the September 11th Attacks. On April 18, 2013, Blythe performed works made famous by Kate Smith on the PBS program Live from Lincoln Center - Celebration: Stephanie Blythe Meets Kate. In June 2014, Blythe premiered the starring role of Gertrude Stein in Twenty-Seven, a new opera by Ricky Ian Gordon (music) and Royce Vavrek (libretto), commissioned for her by the Opera Theatre of Saint Louis. Blythe has also performed roles with opera companies in Europe, including the Deutsche Oper Berlin, the Royal Opera, London and the Opéra National de Paris. Other companies she has sung with in the United States include Arizona Opera, Opera Boston, Pittsburgh Opera, and Tulsa Opera among others. Blythe has educated young singers across the country in master classes, some of which include appearances at the Curtis Institute of Music, the Juilliard School, the Manhattan School of Music, and the USC Thornton School of Music, among many others. Blythe is on the faculty of the Tanglewood Music Center's Vocal Arts Program, at the summer home of the Boston Symphony, and the week-long vocal program known as the Fall Island Vocal Arts Seminar (which she founded in 2012 at her alma mater, SUNY Potsdam, Potsdam, New York). In 2018, Blythe was appointed to be the artistic director of the Bard College Conservatory of Music Graduate Vocal Arts Program, succeeding Dawn Upshaw, VAP founder. She received the prestigious Richard Tucker Music Foundation Award in 1999. SUNY Potsdam awarded her the degree of Doctor of Music honoris causa in 2006. In 2007, Blythe was an Opera News Award honoree, the youngest artist ever to receive this award. ^ a b Anthony Tommasini (February 17, 2008). "A Future So Bright It Can Handle Dark". The New York Times. ^ Allan Kozinn, ""An Untethered Approach Is Back in Style"". New York Times. 23 September 2011. Retrieved 22 April 2013. ^ "Master Class with Stephanie Blythe". Opera Philadelphia. ^ "Juilliard Master Class with Stephanie Blythe". Richard Tucker Music Foundation. ^ "Stephanie Blythe Master Class at Juilliard". Voce di Meche. ^ "Master Class with Stephanie Blythe, Voice". Manhattan School of Music. ^ "Mezzo-soprano Stephanie Blythe conducts vocal & piano masterclass". USC Thornton School of Music. ^ "Tanglewood Music Center". Vocal Arts Faculty. ^ "Fall Island Vocal Arts Seminar". Fall Island Vocal Arts Seminar. ^ "Stephanie Blythe: With A Song In Her Heart: Article featured in Classical Singer". Fall Island Vocal Arts Seminar. ^ "Past Seminar Seasons". Fall Island Vocal Arts Seminar. ^ "Bard College Appoints Renowned Opera Singer Stephanie Blythe New Director of Graduate Vocal Arts Program". Bard News and Events.